“Brace, brace, brace!” I repeated in my head. Knowing impact was imminent, I crossed my arms, gripped my hands neck-level to the top of my belt straps and dug my chin deep into my chest. I only managed one small, shallow breath before the plane flipped and rushing waters overtook me. My initial reaction was one of panic, but I knew that would only make things worse. Instead, I did my best to stay calm until the violent motion of the crash ceased. The wait felt like forever. When the movement finally stopped, I opened my eyes and was met by a sea of darkness. I felt around trying to orient myself. Keeping my left arm in the brace position, I ran my right hand down to my leg for reference and up to the rim of the panel in front of me. If I held onto that rim, I knew I could follow it down to the exit on the other side of the aircraft. Pressing my feet firmly into the floorboard, I used my left hand to unlatch the seat belt and slowly began scooting toward the other door. My feet hit some kind of obstruction along the way. I had to lift them up and over it, taking care not to let them drag behind me. I needed to keep my bearings. When I reached for the door, it wasn’t there. So, I curled the fingers of my right hand around its frame, pulled myself through and began swimming up to the surface of the water. That’s how long it took from the moment water began flooding my sinuses to the moment I broke free on top. When I reached the surface, the wind, lightning and rain stopped, and the lights of the room were turned back on. 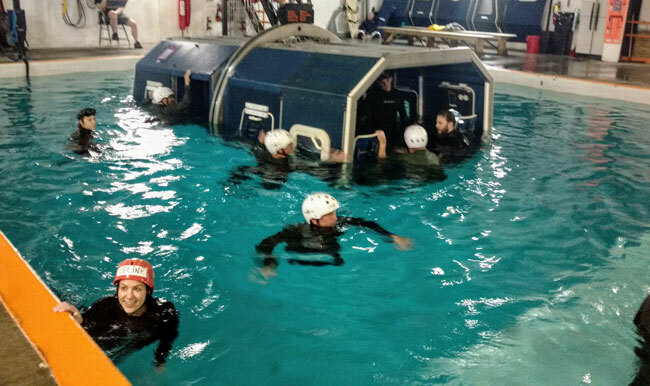 I had successfully completed my final run in aircraft ditching and underwater egress training. The two-day “General Emergency Duties” course is one of several offered at Survival Systems USA, Inc. (SSUSA) in Groton, Connecticut. 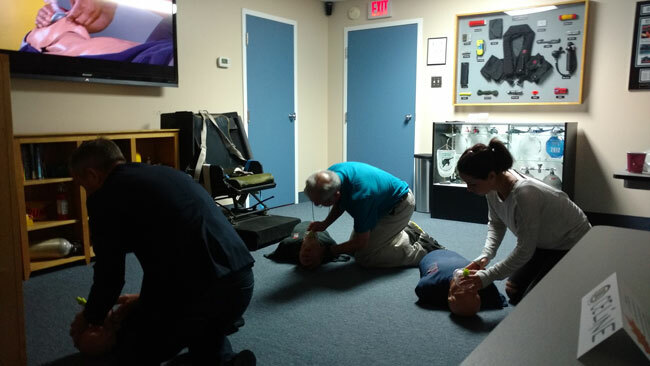 The two-day course, “General Emergency Duties,” is one of several offered at Survival Systems USA, Inc. (SSUSA) in Groton, Connecticut. I learned about it online and, always interested in ways to increase my safety as a single-engine private pilot, I was immediately intrigued. I just passed my checkride last year, so I’m fairly new in the aviation community. I figured this course was likely well-known and that others had either taken it or something similar to it elsewhere. After asking around, I was surprised to learn that not only was I wrong, but the only people I could find who had done something like this had only done so because they were forced to: their job required it. I couldn’t understand. Why wouldn’t other pilots want to be voluntarily strapped into an aircraft, ditched in the water and flipped upside-down? Weird. I started to wonder if maybe I was being silly to want to take this course, and whether it was really only beneficial to helicopter pilots, commercial pilots or pilots who spend a lot of time flying over water. I’m none of those. About the most I fly over water is for the occasional $100 hamburger run to Martha’s Vineyard, and I always stay in gliding distance to land. Beyond underwater egressing, the SSUSA course also covered topics such as hypoxia recognition, hypothermia mitigation, aircraft survival equipment use, crewmember emergency coordination and extinguishing fire in the cockpit. Day two involved training in first aid, CPR and AED. I spent some time weighing my doubts against my better-safe-than-sorry attitude. I also considered the fact that, even though I’m rarely over water, I fly fixed-gear planes, which have a bad habit of flipping when they do have to be ditched. The SSUSA course also covers CPR, hypoxia recognition, hypothermia mitigation, survival equipment use and extinguishing cockpit fires. I could see no downside, so I and another brave pilot—a friend who passed her checkride around the same time as me—decided to go for it. To my relief, they don’t just throw you into the water and start dunking you. The first half of the day is spent in a classroom, where videos are watched, real-life survivor testimonials are heard, and safety techniques are discussed. Once you get out to the pool, they cover other items first, like proper use of a life preserver, deploying and boarding a raft, and techniques for open-water survival. Once it was my turn, I was a petrified mess. 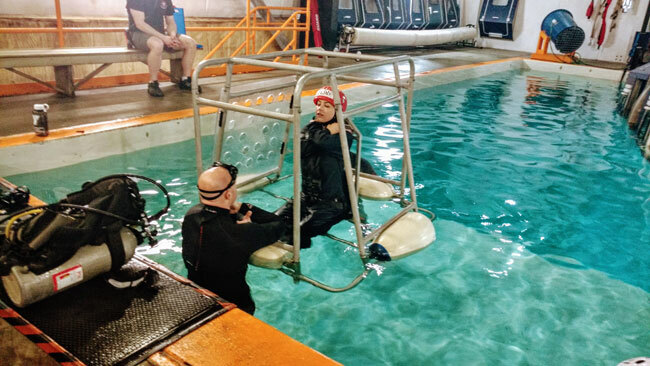 Instead of doing the Shallow Water Egress Trainer (aka, the “SWET Seat”) twice like most students, I had to do it four times—a couple extra until I could get it right. 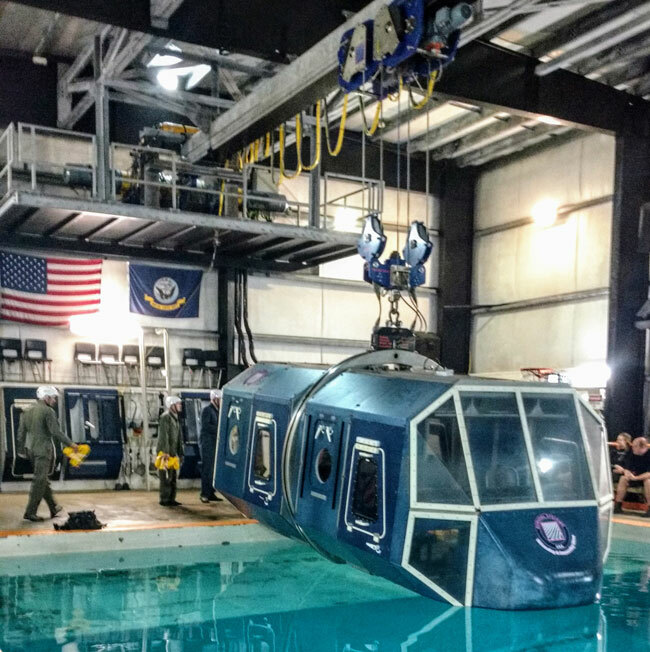 The Shallow Water Egress Trainer (SWET) is used to practice emergency landing and ditching preparation. Physically, I found the experience less challenging than I anticipated. Psychologically, however, the course was quite difficult for me. All of my insecurities came flooding back—I’m not good enough, not strong enough, not smart enough. I also had flashbacks to an accident I was in many years ago, one in which I had to escape from a smoke-filled car with a jammed door and multiple broken bones. I kept reminding myself that, while others in the course were there because they were required to be, I was there because I wanted to be. I could have left at anytime. Instead, I decided to play my emotions like I would a real emergency situation—and in a real situation, I couldn’t just close my eyes and make it all go away. I had to face it, deal with it, survive it. Climbing into the big blue Modular Egress Training Simulator (METS), I was first shown proper bracing methods during aircraft ditching. First, all loose items are tucked away, including seat belt straps. Next, the feet are placed flat on the floor and the thumbs are rolled to the outside of the controls to prevent hand injury. Right before impact, the chin is tucked into the chest and the body leaned into the straps. They also showed us alternate variations, such as the one I used during my final run. The Modular Egress Training Simulator (METS) provides evacuation and escape training. “Yes, you can,” he reassured me. No, I can’t, I thought. And I did. The first time we hit the water and flipped, I panicked and went straight for my seatbelt to unleash myself. My arms were flailing around looking for the door. There was nothing calm and methodical about my movements. I was all over the place. But I got better with each run and, surprisingly, the final one in the dark with gale-force winds, torrential rain and flashes of lightning was the one that scared me the least. By that point, I was finally getting a handle on things. More importantly, I was finally getting a handle on myself. The added elements were just distractions. While I contribute much of the reason I successfully completed the course to self-determination, I also owe part of my success to the exceptional staff. The instructor I was with calmed me and stayed right by my side the entire time. They had one instructor assigned to every two students, and an additional two divers in the water on either side of the simulator at all times. Everything was safe. Despite my fears, the only real danger I faced came from within. The big thing I learned was that panic gets you nowhere and, in fact, is the most dangerous thing one can do. Less than a week after taking the course, I met a pilot who had once flown a seaplane that cartwheeled upside-down on landing. Having trained in egress and regularly briefed herself on this kind of scenario, when water started filling the cabin and the plane began sinking, she was able to remain calm and rationally think her way through to safety. True, it’s likely that I’ll never be involved in a situation that requires me to escape a cockpit submerged underwater, but I’m confident that the skills I developed being placed in these scenarios have made me a safer pilot and more likely to survive if the worst ever does happen. So, no, it was definitely not silly for me to take this! A course in aircraft ditching and underwater egress techniques isn’t just useful to pilots—all pilots; it’s useful to anyone interested in learning what they can accomplish when they don’t let fear dictate their decisions. All that information but no price for the course???? I would be really interested to initiate a similar facility in South Africa to deliver this ki d of training. American had had a ditching trainer years back. I think it was in Ft Worth. It was used to train cabin crews and pilots. My brother in law worked for AAL, and his kids always looked forward to being passengers in the trainer. Dale – Survival Systems offers multiple versions of this course, some one day and some two day. Cost of each course varies. If you are interested, give them a call for information on rates.